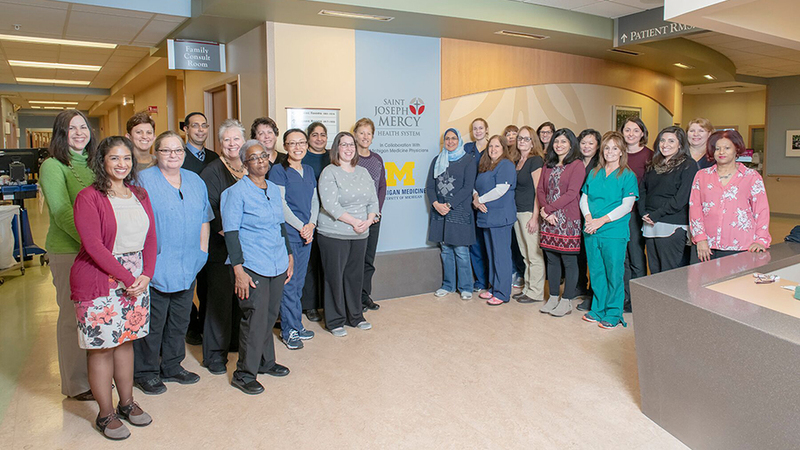 Through an innovative collaboration, Michigan Medicine patients can be admitted to a special Michigan Medicine-staffed unit on the 10th floor of St. Joseph Mercy Ann Arbor. The unit is designed to provide care for patients with general medical needs and elderly patients who can benefit from some of the specialized geriatric staffing and features present on the unit. Patients will be cared for by a team of general medicine hospitalists and geriatricians from the University of Michigan, in collaboration with IHA physicians and St. Joseph Mercy Ann Arbor physicians and staff. Your Michigan Medicine primary care providers and specialists will have access to important information about your care every step of the way. 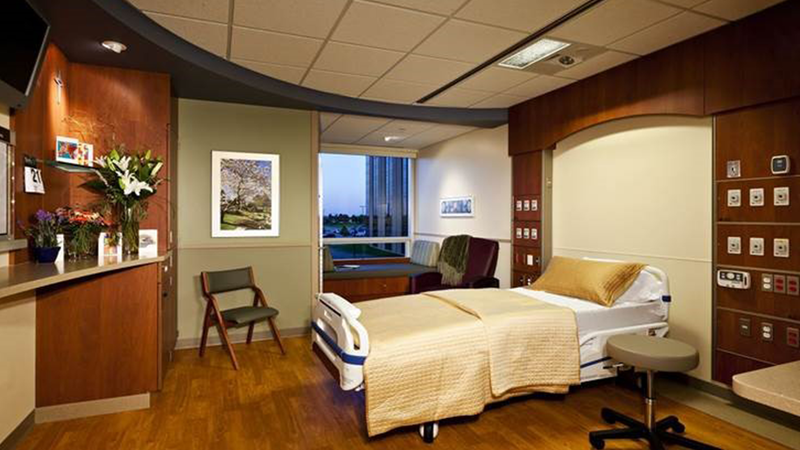 Who can receive care on the 10 East Medicine Unit at St. Joe’s Ann Arbor? If your physician determines you need inpatient hospital care, he or she may recommend you be admitted to 10 East Medicine Unit at St. Joe’s Ann Arbor. The unit is designed to provide care for patients with general medical needs as well as elderly patients who can benefit from some of the specialized geriatric staffing and features present on the unit. Who will be on my care team? Your Michigan Medicine doctor will be overseeing your care in collaboration with Integrated Health Associates (IHA) nurse practitioners or physicians, in addition to St. Joe’s nursing and support staff. You may also see a Clinical Assistant, a Michigan Medicine employee, who will be working to coordinate your care for a smooth transition after discharge from the hospital back to your primary care doctor and any existing specialists you see. Rest assured, the entire care team will be working closely together to give you the best care possible. How am I transferred to the 10 East Medicine Unit at St. Joe’s Ann Arbor? Your transport will be facilitated by Emergency Department (ED) nursing staff. Neither you, nor your insurance, will be billed for the transfer. Where do I direct my family/loved ones? After 10:00 pm, visitors can use the St. Joe’s Emergency Department entrance to obtain badge access to your room. Who will I receive bills from for services provided? Because the unit is located in St. Joe’s Ann Arbor, St. Joseph Mercy Ann Arbor and IHA Physician Group will be billing for your care. You may also receive billing paperwork related to your Emergency Department visit at Michigan Medicine, if you go there before being admitted to the unit. Will my care be covered by my insurance? A thorough process has been developed to evaluate insurance coverage upfront to ensure that patients and their families fully understand how their insurance coverage will apply to the care they receive on the 10 East Medicine Unit at St. Joe’s Ann Arbor. If a gap in your insurance coverage is discovered, our team will discuss this with you as soon as it is identified. Care management staff in the Michigan Medicine Emergency Department or at St. Joe’s can help answer more detailed questions you have about your insurance coverage. You may also contact a Patient Financial Counselor at 877-326-9155, Monday - Friday, 8:00 am - 8:00 pm. After hours and on weekends, you may contact Patient Business Services at 734-232-9024. How will Michigan Medicine and St. Joe’s share electronic medical records and documentation? Providing seamless transitions and ensuring patient safety is of great importance to St. Joe’s Ann Arbor and Michigan Medicine. While we do not share the same medical records systems, our long-standing collaborations have led us to develop efficient ways for our medical staff to locate and share patient information within each system, including visit and discharge summaries. A thorough process allows both health systems to access pertinent patient information to ensure high quality care, and smooth transitions for you as a patient. For more information about the Michigan Medicine collaboration on the 10 East Medicine Unit at St. Joseph Mercy Ann Arbor, call 734-712-6001.